The month of May is special for personal historians. But this year it has been extra special for me. Every May is Personal History Month, as recognized by the Association of Personal Historians. Mother’s Day was May 10. May 16 is International Storytelling Day. The theme this year is about human rights and immigration. Canada has Victoria Day on May 18th. And a special day of remembrance is May 25th, Memorial Day. But May 2 was a day that I will always treasure. 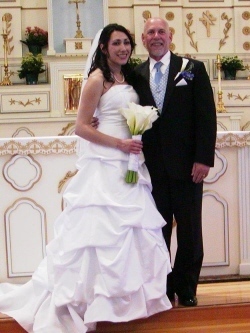 My daughter married and it was truly a beautiful and blessed occasion. Walking her down the aisle I was bursting with pride. I’m excited for this new part of her life with her husband, Nathan. And I’ve gained a son-in-law. Family is so important. And so is preserving your family history. The month of May is set aside by personal historians as the month to generate awareness about the importance of personal history. The Association of Personal Historians (APH ) officially recognizes this month and encourages people to do something to preserve their personal and/or family history.